I have loved The Smiths since May 1983 when aged 15, having just heard a song of such startling beauty, poignancy and strangeness on John Peel’s radio show, half asleep I scrawled its title in pencil on my bed head so I wouldn’t forget it: Reel Around the Foundation. I never write emails like this, being today a slightly grumpy middle aged man. But after being witness to what you achieved on Friday night at Leamington I want to break the habit of a lifetime. Quite simply, I have not been to a gig I enjoyed more in 25 years. I was once the proud owner of a ticket to see The Smiths at the Royal Albert Hall in 1985. It remained unused (another story!) and I never got my chance again. So my love of Smiths songs is sustained only through records and television. You did something incredible and moving on Friday night. You took the music I have loved for 32 years and breathed new life into it, allowing me to experience it in a whole new, vital way. Your performance wasn’t about nostalgia. It was about the here and now, about dancing my legs down to the knees with some of the people I love most in the world. It was about being totally lost in the power of great songs brought so vividly to life. Of course you achieved this through being incredibly accomplished technically – all four of you. That is just the springboard though. Your mastery of the songs allows you to make the leap into creating something truly special in a live context. Your performance of I Know It’s Over exemplified this. In a canon of great Smiths recordings, to me the live rendition of this song on the Rank album remains one of the most powerful and emotionally charged of all Smiths songs. Big boots to fill! You took this song on and made it your own – you owned its power for yourselves. This wasn’t watching a tribute act. It was witnessing a great song meeting a great performance to create something truly memorable. Thanks so much for doing what you do. And for being so bloody good at it. I was one of the two old geezers on Friday night at The Wedgewood Rooms right on the very front barrier. I’m 57 and my mate who was alongside me is 60. He had no idea of any of the songs or even who The Smiths or The Smyths are, yet by the second half he was dancing around like a Duracell bunny that had been plugged into the mains. He had the time of his life. As I mentioned to a couple of you after the gig, last year I brought my daughter Gilly who you dedicated “There is a light” to. She was SO in awe of you last year that she decided she wouldn’t come this year as (in her words)”…it was just SO brilliant that it could never be bettered”. Put simply, Friday night was (ONCE AGAIN) simply awesome. I cannot thank you enough for such a brilliant, brilliant evening. Congrats on an excellent night on Friday...you really nailed it ...again. Looking forward to October! I would like to say how much I enjoyed the concert on Saturday night in Islington. I will be honest with you and say that when my friend asked me if I would like to go to the gig, I was a bit sceptical about it, purely because I'm not one for the 'Tribute' bands so to speak. For me The Smiths (like most Smith fans) meant everything to me when I was a teenager, as they still do today. The words, the music, what they said, stood for etc, I could just relate too. So for me they were simply untouchable and I always thought no one will ever come anywhere near to pulling them off in the world of tribute bands and that no one should even consider to do so. They were/are just to iconic a band for me. Hi Lads, just want to say how brilliant you guys are. My best friend and I went to see you in Putney tonight and we were blown away with the talent you all have as musicians. You are definitely the best Smiths tribute band out there. Thank you for a wonderful evening. We will be seeing you next year! Hi!I went and saw you with some friends in Oxford recently - brilliant! I've just bought 20 tickets for Putney on 23rd Nov ! Hi All, Am just dropping you a note to thank you for a great night last night. It was the first time that I had seen you live and thought you were nothing short of fantastic. The band is as tight as any I have seen and did a real credit to the songs that saved my life. You yourself were fantastic and I look forward to seeing you again in the near future ( I was the one who threw my t-shirt for you at the end for which I apologise he he). Once again, thanks for a fantastic evening. Hi, A few weeks back my other half booked tickets to see you guys, I'll be honest i am 49, and have been a smiths fan and morrissey fan since '82 so as you know mozzer's songs are close to our hearts (rubber ring) so i had deep reservations about your band, but the great thing about life is sometimes it suprises us, i was gobsmacked!! !firstly the music, great musicians, and your vocal delivery was amazing the irony is, i saw the smiths in 82 and you sounded better than them, mind you the university pa was a bit crap.But anyway excellent, thankyou. Come back to oxford soon my sister wants to see you. Hi there I just wanted to say what an absolutely fantastic gig you put on in Glasagow on Saturday night; I have been a massive fan of Morrissey and The Smiths for over 30 years and I have to say that this was one of the best gigs I have ever been to.....please hurry back to Scotland!!! Hi, Fantastic night at Newcastle last night guys. Loved it. Great for a group of 40-somethings to remember those times. Cracking set and great crowd. Thanks for taking the time to have your picture taken with us at the end.Keep doing what you do. Morrissey rules. First of all can I just say what a brilliant set you played on Saturday night in Darlington, all of my favourites included. I just wanted to send a thank-you for last night's gig, it was totally spectacular and a real birthday treat! Being right at the front was such a brilliant experience, even grabbing Mozzer's hand! The setlist was fantastic, you (unknowingly) played all my favourites, and they were note-perfect and such a blast. I never got to experience The Smiths, but now I don't think I'll ever have to. High notes a challenge...? What was I talking about...? You absolutely nailed it...! Fantastic Chaps, and thanks for the shout. Top top night...always enjoy it. I saw you on the Friday of the IOW festival in the Hipshaker lounge.This was the highlight of my weekend.The crowd was jolly yet a bit wild, and I loved the way security hated everyone going nuts and diving about. I recommended you to my brother and Sister, who recently went to Portsmouth to see you and they loved it. Keep it up guys! "Great gig.By far the best band on Friday"
"the highlight of our weekend"
I was at the Tamworth gig...throughly enjoyed it. Tremendous set from a terrific band. Hope to see you v.soon. The Smyths came on and it was indeed a blistering set..a BRILLIANT night...The Smyths are indeed the BEST Smiths tribute band in the world. Last night was just fantastic. Great performance in Darlington last night - "I know it's over" - fantastic! The bass player could have chucked his rose at me, mind. Phwoar! Hi there, just to say what a fantastic show you and the lads put on at the Rescue Rooms last night. I liked the fact that you included less obvious tracks in the set and to finish with hand in glove was superb. Saw the band Saturday at the Forum and can honestly say having seen Morrissey (but not The Smiths) you were spot on ! We saw you in Leeds in February and thought you were terrific. When are you coming to North America? Canada and the U.S. would welcome the Smyths with open arms. No one is doing anything even comparable here, your fans await. Me and my husband came to see you on the 23rd, you were absolutely brilliant, it was a great night. PLEASE COME BACK SOOOOOOOOOOOON. Hi!I was at the front at Birkenhead the other night,I just had to say you and the band were seriously fantastic!!!! I just wanted to say I have been listening to your mp3's and as a massive fan I think you are uncannilly accurate and are the nearest we will get to the old original sound. seen you in birkenhead at pacific road ... absolutley amazing. 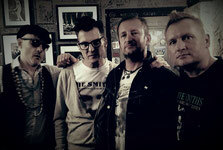 I am a huge Moz fan -seen him many times - this may sound crazy but I prefered seeing The Smyths; its the up close and personal thing. All the best and keep the faith. We were there at the flowerpot in Derby and can i just say how amazing it was. Due to my age, i never got the chance to see The Smiths, and you were fantastic, making it a truely memorable time for me. As a very passionate Smiths fan, I did have reservations about seeing a tribute band, but I must say fella what a totally top show. Blew my girlfriend and me away. Having seen the Moz a few times I can only say you have the act down to a tee. What's more, the 25 or so songs you knocked out were musically stunning pass my congrats to the band. As a bit of a aging guitarist myself I know the difficulties in covering their songs (tried to add Boy with the thorn in his side to our set without success). Anyway as I say top marks and long may you continue, look forward to your return to Portsmouth. Have never sent an email to any band before, but felt the need after such a great night..
Hello 'Moz'. Many thanks for the 'shout out' on Friday. What an awsome gig! As I said before it was the first time we had seen you and without doubt (as I'm sure you have been told many times before) you are as close as it comes to seeing the Smiths live. It was a real treat to see such a great live performance and aside from your fantastic vocals (of course!) I have to say the rest of the guys have their music note perfect, fantasic!That was all, just a thank you really, and we look forward to seeing you next time you are down our way (Bournemouth/Poole/Dorset).